Since the United States is our biggest ally, as generations of white papers have told us, it’s fair to say we want to be interoperable with their forces in a coalition setting. With this in mind, the Defence Materiel Organisation (DMO) on behalf of governments of the day has made excellent use of the Foreign Military Sales (FMS) framework to procure various platforms and technologies. Sources: DSCA notifications, with historical exchange rate and CPI corrections. In the US, Section 36(b) of the Arms Export Control Act (AECA) requires the President to give Congress advance written notification of the intent to sell defence articles, equipment and services. The DSCA prepares and delivers the notifications to Congress only with the approval of the State Department. Once Congress has been notified of a proposed arms sale, the President must publish an unclassified version of the notification in the Federal Register. Thus, DSCA announces the details of the proposed deal. This doesn’t cover every single FMS cases that passes through the system but it gives a pretty good indication of the acquisition efforts. For one thing, there aren’t near as many as I would have thought. 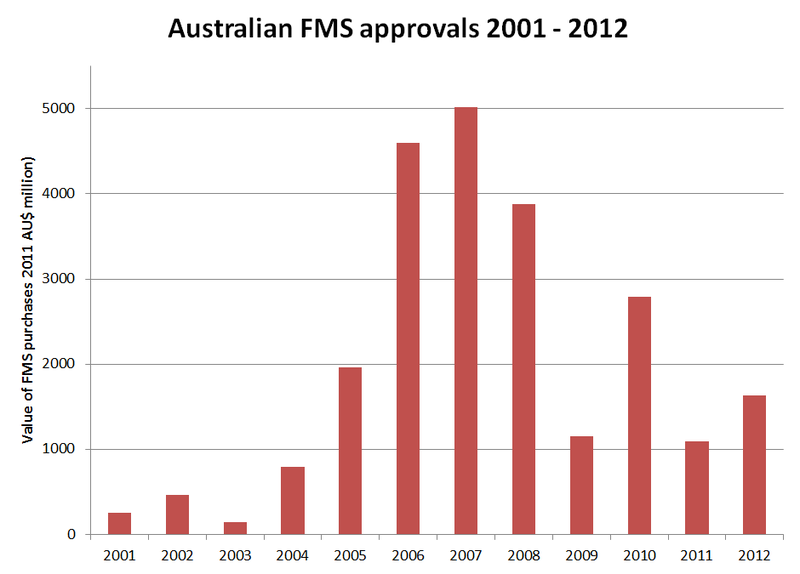 Figures from our own department confirmed that between 2000 and 2011, 714 FMS cases passed through the system. The rough breakdown between sustainment and acquisition was about 50/50 but by value acquisition is the lion’s share. The other fact to come to light that was of the hundreds of FMS cases put to the US, only 10 were not progressed. So once the DSCA makes an announcement that we’re interested in something, we tend to get it, regardless of the competition rhetoric in Australia. Yes(? ), there is sometimes no other way to access the technology. For another view of FMS, ASPI’s 2012–13 Defence Budget Brief contains data collated by Mark Thomson. His graph showed the actual in-year spends rather than the approvals. For example, the $3.1 billion for the Super Hornet approval inn 2006 was spent over the following five or six years. The two views are complementary. And, from the ‘shameless plug’ department, you can read more about the wider story in my magazine next month. Katherine Ziesing is editor and sometimes promoter of Australian Defence Magazine, an independently published magazine on Defence capability and procurement. She is also a board member of the Sir Richard Williams Foundation, an air power think tank.